! This is NOT a method of direct communication with RAYFORD FLORIST & GIFTS for purposes of ordering or rectifying problems. The flowers I received were for my birthday. They were full of color and brightened my day. The flowers were in excellent condition and very fresh. I do as instructed, and clip the stems allowing water intake to keep them fresh. It works! They still look as beautiful as the day they arrived. Rayford Florist always delivers in more way than just flowers. highly recommend to others. The plant I ordered was absolutely stunning. Thank you!! Excellent service and recipient was VERY pleased! Thank you! I ordered from out of town and was very pleased with the promptness of delivery. I did not see the arrangement but the recepient said it was beautiful! Thanks so much! Mom loved the birthday flowers! Great service and beautiful arrangement. Excellent service, beautiful plant. I will come back to you in again. Website is easy to navigate through and fast delivery, will definitely be using them again! Very good experience, I will use them again. Thank you so much to the associates at Rayford Florist!! The service provided was extraordinary! My mother enjoyed her floral arrangement!! Thank you for creating the most elegant funeral spray for our nephew. It was exactly what we wanted. I highly recommend Rayford Florist. Very fast delivery. Wife loved them! The flowers were beautiful, I was very pleased. 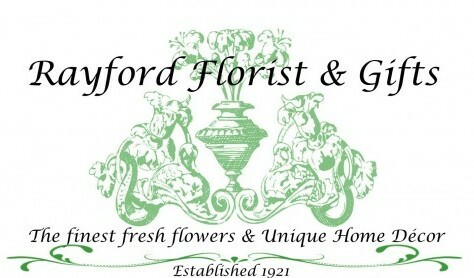 Will use Rayford for future floral needs. Friendly, honest and prompt service! Very pretty flowers! All fresh and smelt good. Service was very quick and the arrangement lasted more than a week. Prompt delivery and beautiful flowers. However, having to pay a service charge AND delivery fee is a little frustrating. Daryl: Our website provider charges the service charge for use of the site. We do not receive that fee. We have reduced the delivery fee which we receive from $10 to $5 to "rebate" the service charge. You can save this fee in the future if you call directly. Thank you for your order. We appreciate your business. I appreciated the prompt delivery on Monday in time for the funeral service since we live out of state and were unable to attend. Ordering online was easy and auto-response emails kept me fully informed. Thank you!! Extremely pleased with website ordering service and the arrangement was absolutely beautiful. Very quick delivery! If I could, I would give Rayford Florist ten stars. I will definitely use this florist again. I live in fort worth and only use Rayford Florist for any flower or gift basket delivery. They have been so accomidating to me when i call with questions, delivery is quick, and everyrhign always looks remarkable. So grateful to have a consistent go-to for deliveries back home, when i cant be with friends/family physically. I love the care this shop takes to make sure all needs are met. The flowers are always fresh, beautiful and have s long life. Thanks guys, you’re AWSOME!! Rayford's is very accommodating and helpful. Ordering online is easy and convenient. The flower arrangement looked better than the picture. It’s always s pleasure to order from Rayford Flourist, the flowers are fresh and last for a very long tome. Incredibly fast service! Will definitely use Rayford again. Always has the most beautiful flowers. I have never been disappointed getting flowers from Rayford. Excellent, personal, caring service in every possible way. Thank you! Thank you for delivering before Christmas in spite of the rush!! You made my aunt’s day — and mine! Wonderful, thoughtful service! I was very pleased with shopping at this florist. It had the flowers in stock and was delivered in a timely manner. No complaints! I was very impressed with the rapid service your all provided. My friend indicated that it was a very nice arrangement and he appreciated greatly. Thank you. I placed 2 orders of flower for my Dad's funeral and both were beautiful arrangements! Thank you for taken such passion in putting these together. You guys are the most excellent shop I've ever dealt with. The flowers are always delivered with speed and they stay fresh forever. My niece loved them and received many compliments on them. Thank you. The Owners are amazing went above and beyond to make sure the custom arrangement they created met my expectations. Rayford Florist's exceeded my expectations and even sent me txts of the beautiful arrangement and Delivery was before noon! very easy to see what you're looking for. Due to the need for a funeral arrangement the week following Mother's Day the flowers we ordered online were unavailable. The gentlemen from the florist called and spoke to me personally, listened to my concerns, and then delivered a stunningly lovely arrangement to the funeral home that exceeded my expectations. If I could give them more than 5 stars I would do so. The service was exceptional. It is a pleasure doing business with someone who cares about their customers. Mother was in Henderson visiting uncle. Her birthday was during this time. Ordered online and had you deliver fruit basket (she is diabetic). Excellent basket, timely delivery, no issues. Highly recommend! I couldn't be there for my girlfriends birthday because of the military, but ya'll helped make a special day more wonderful by delivering the perfect bouquet that made her day!!!!! Thank You from the bottom of my heart! The flowers for the funeral were very beautiful and delivered in a reasonable time. Awesome service!!! Initially scheduled for delivery the next day, but were able to get them out and delivered within 2 hours!!! The flowers were for my mother in law who just lost her own mother earlier in the day. Thank you so much for help make her smile!!! Oh my gosh I am so happy with this florist! The arrangement I ordered is absolutely gorgeous! I ordered the arrangement and they were delivered within an hour! Super happy and the recipient loved them! Thank you very much. We try very hard to make our customers happy! I love your floral shop!! Every time I've ordered, the flowers have been very fresh, they've lasted extremely long and the arrangements have been beyond my expectations. The care that has been taken from preparation to delivery is well worth it and the cost is well worth it. Thank you so much. We love what we do and always hope that it translates to our flowers! Beautiful flowers always delivered on time. You can count on Raford to do thins right. Excellent service, affordable prices, and my mother loved the gift. Will definitely do business with you again. The flowers are outstanding that you offered. If an occassion arises again I would definitely return to Rayford Florists for ordering flowers. Lovely arrangements. You guys did an amazing job. Thank you so much for being there when I could not deliver personally. The flowers were beautiful as always. I have received several arrangements from Rayford Florist and I have never been disappointed. It was great to be able to place an order with a local florist. The flowers looked great. Thank you. I actually live five hours away, in Burkburnett, but when I need to order flowers I always use Rayford Florist, you guys have such a fresh selection and the flowers last for a very long time. I always trust that you will send the most beautiful selection, thank you. Great experience and happy with the results. I ordered an arrangement for the funeral of an associate. I received a call within minutes of placing the order to inform me it was received and to get permission to make the arrangement more appealing for a male. I appreciated that personal touch. Also my credit card was not charged until after the deliver was made. Thank You! John was extremely helpful. I called at the last minute before closing for flowers to a funeral Saturday morning and he never even paused. He took good care of my needs. What excellent customer service! Great arrangement. Quick delivery. Will do business with Rayford in the future! Beautiful arrangement, delivered promptly. Thank you. Great service! Pleasure to work with. Flowers were perfect. Store called to say that someone else ordered same thing and wanted to see if it would be ok to change it up! Perfect! Thank you! The service is always impeccable and the owners are extremely helpful & nice. Highly recommend! Most beautiful Stargazer Lilies I have ever received. Wonderful. And tell about half left to open. Will enjoy them for days!!!! I ordered flowers at the last minute for a funeral. I was concerned about getting the flowers delivered on time. They were there in plenty of time and looked beautiful! Thank you so much! Was extremely pleased, as always, with Rayford Florist, Henderson, TX. Would suggest having an answering machine stating hours of business when it is closed.